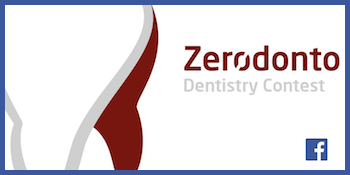 The aim of this work is to explain how closing the diastemas is possible in an orthodontic lingual approach without brackets. The choice between the two types of devices depends on whether there is a need to change the shape of the arch and solve a misalignment or not. In case there is this need a retainer with loops will be used. 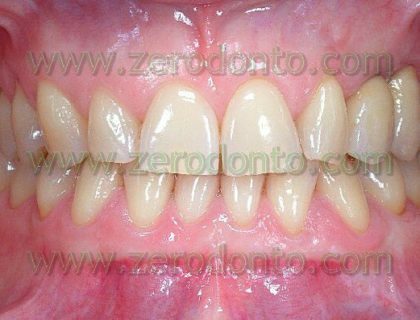 If the shape of the arch and the position of the teeth are ideal (in buccal-lingual and occlusive-gingival sense) a sliding mechanics with rectangular steel wires will be made. The spaces are closed shaping vertical loops, e.g. U loops, on a 0.175 inches retainer wire. Suppose there is the need to close a diastema between two central incisors, the mandibular ones, unlevelled in buccal-lingual sense (B-L). 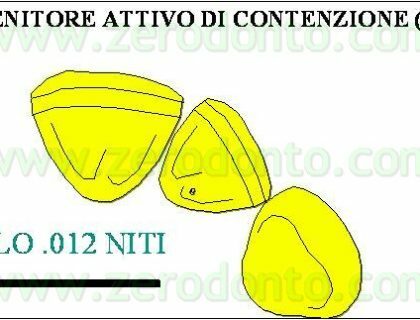 And suppose that the 31 is more lingually displaced than the other dental elements. It is possible to deal with this dental malposition shaping the retainer wire so that it passively adapts to the lingual surface from canine to canine. 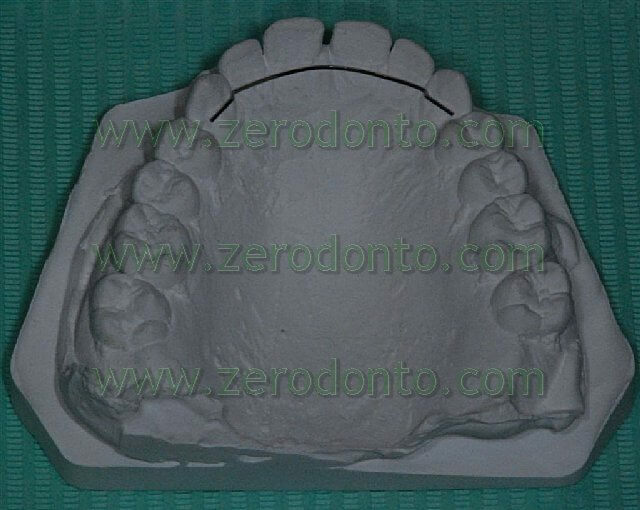 This wire will be shaped with a U loop between elements 31 and 41 and will be activated with the procedures dealt with in the previous articles (pre-activated retainers). The loop will be closed of about 2mm (e.g. 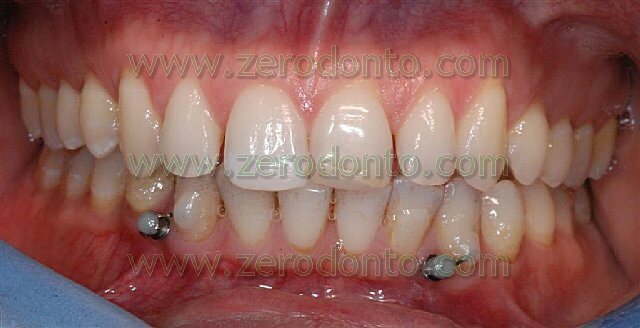 with a lingual arch plier) to activate the retainer in order to completely close the diastema. In order to activate the wire and achieve the levelling the segment to be bonded on element 41 will be bent lingually and the one to be bonded on the 31 buccally. The bending is achieved holding the first vertical segment of the loop with a plier (e.g. a bird beak plier), holding the second vertical segment of the loop with another one (e.g. a Weingart plier) and applying a torque in B-L sense. 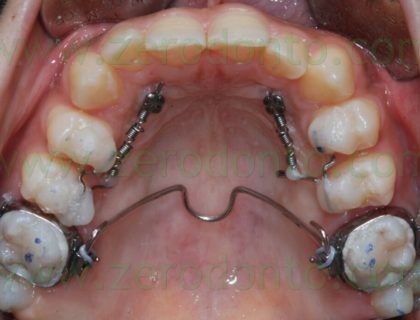 It is also possible to activate the retainer and achieve the levelling in other ways, for example making a V fold with the peak heading buccally by the segment of the wire to be bonded on the 31. 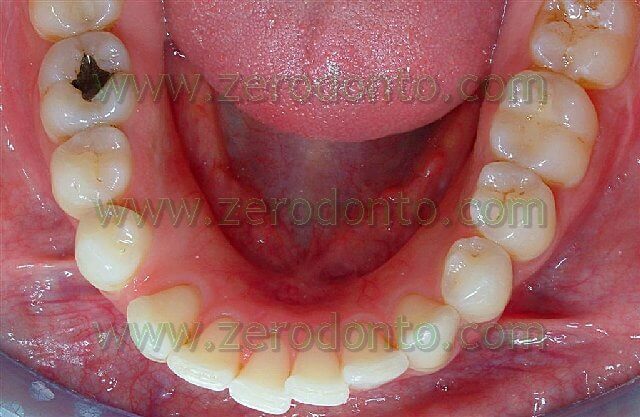 At this point the retainer is bonded according to the procedures explained in the previous articles. In the case speculated about, the wire would first be bonded on elements 33, 32, 31 – since the tooth closer to the wire is to be bonded first. Subsequently, opening the loop of about 2 mm, the wire would be bonded on elements 41, 42 and 43. This device would be checked every 3 weeks and, in case the space is not closed, it would be detached from elements 41, 42 and 43, reactivated (closing the loop and creating an activation to move the 31 buccally, if necessary) and bonded. 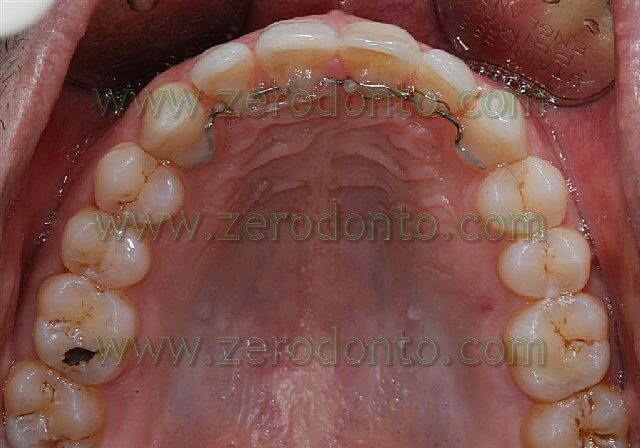 After closing the space and accomplishing the alignment in B-L sense, the active retainer would be replaced with a passive one. The following picture shows an example of spaces closed making loops on a 0.175 inches retainer wire. The spaces are closed using a rectangular steel wire (e.g. a 0.16 x 0.16) shaped without creating sharp bends that would increase friction and block the sliding mechanics. Therefore the wire is shaped after the curvature of the arch. After shaping the wire, the segment to be bonded on the teeth where the sliding mechanics is to be made is isolated making a wax sleeve. This is done using a spatula heated an a flame and some wax. The wax sleeve is made by touching repeatedly first the wax and then the wire with the heated spatula. The part of the wire to be bonded on the teeth that will not be moved is not sealed with wax. That segment of wire, before being bonded, can also be blocked either creating stop bends or making incisions with a small round diamond bur to increase retention after composite application. 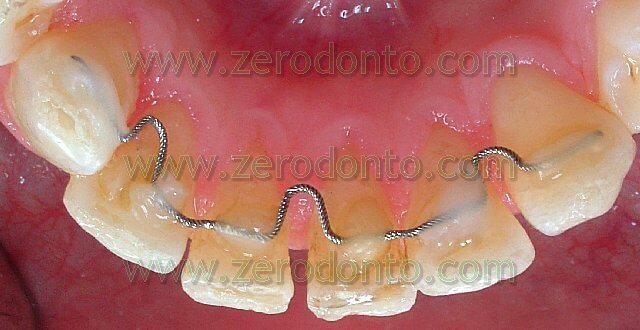 The wire is subsequently bonded following the standard procedures and using fluid composite. The composite does not touch the wire thanks to the applied wax: this ensures low friction and the possibility to make the sliding mechanics. The applied wax, on the other hand, will gradually wear down and eventually totally disappear. 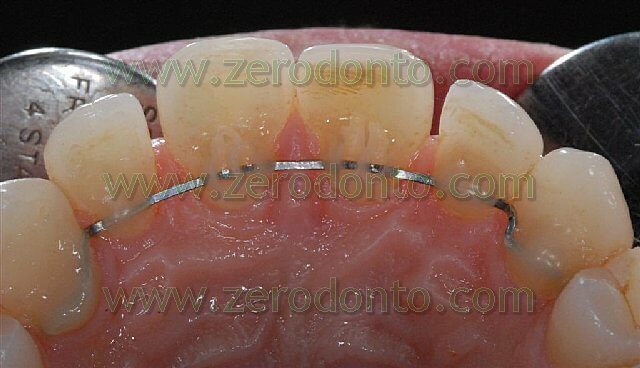 After bonding the wire the activation to close the space (or spaces) is carried out by applying an elastic chain. This is applied using metallic bindings and activated of about 50 grams. The traction is renewed once every 3 or 4 weeks until the space is closed. Once it is closed, the teeth can be stopped either using figure-of-eight metallic bindings or making carvings ranging from the composite to the wire with a small round diamond bur and then filling them with adhesive and fluid composite. The right canine class III is due to the presence of a 3.5 mm. diastema between the 44 and the 43 . 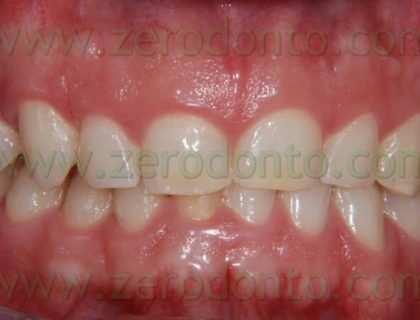 A therapy was carried out to solve the deep bite, close the diastemas and centre the midline. 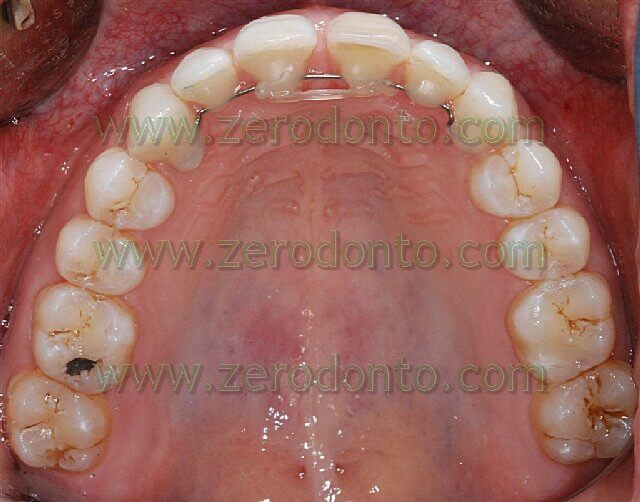 The option chosen to solve the deep bite was the use of 2 micro-screws on the mandibular arch. 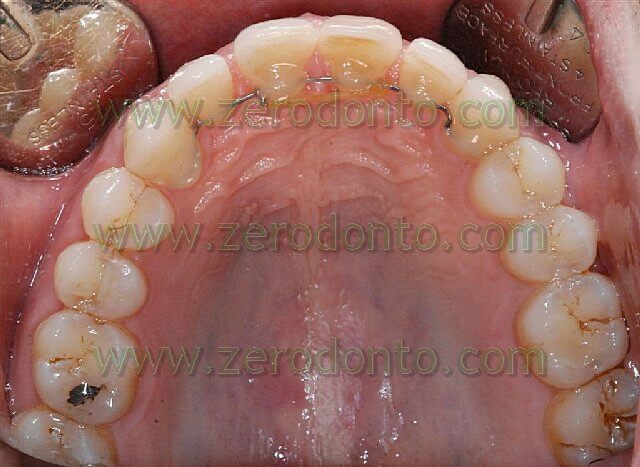 These micro-screws were put on the gums adhering between lateral incisors and canines. 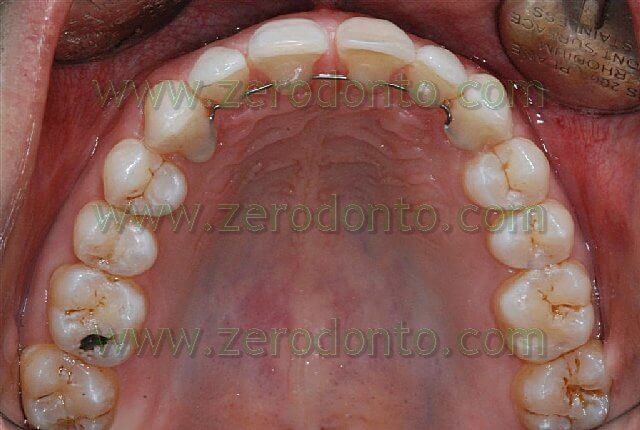 The teeth from canine to canine were bound together shaping a sectional with a steel 0.16 x 0.16 wire: the sectional was to passively adapt to the lingual surface of the teeth and was subsequently bonded with fluid composite. The intrusive force was achieved using elastic chains positioned on the heads of the micro-screws and bonded on the buccal surface of teeth 33 and 43. Once every 3 weeks the elastic chains were replaced. When the intrusion was achieved, the teeth were blocked shaping some sectionals with a rectangular steel wire, inserting them into the micro-screws and bonding them to the teeth. 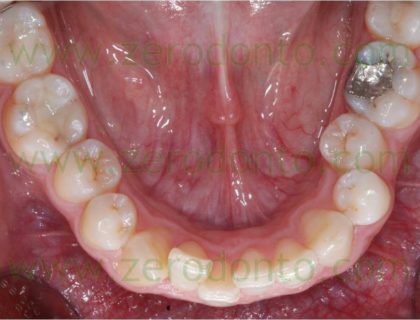 After the reduction of the OVB, achieved after 4 months, the spaces on the maxillary arch were closed using sliding mechanics. Therefore a rectangular 0.16 x 0.16 steel wire was shaped after the arch curvature. It is important not to make sharp bends that would impede the sliding. The offset modelled between the laterals and the canine creates a stop at this point. If there had been no offset, it would have been enough to bend the endings of the wire by the distal surface of the canines. 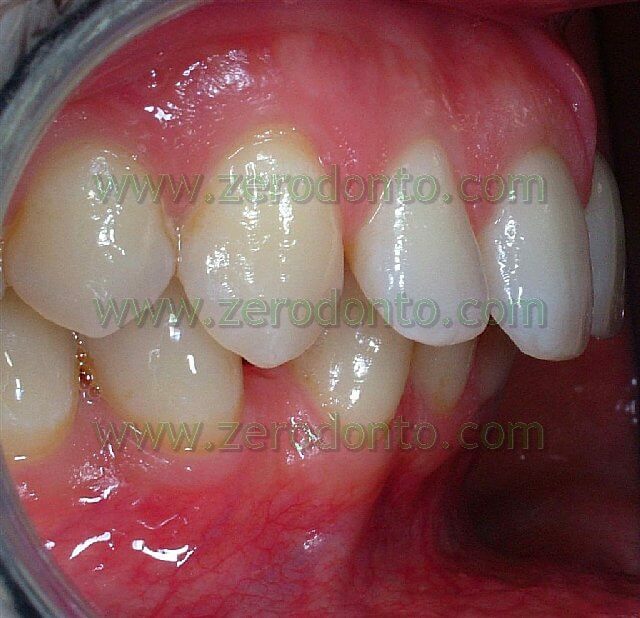 The segment to be bonded on central and lateral incisors was sealed making a wax sleeve, as previously explained. The presence of wax prevents the fluid composite used to bond the wire from touching the wire itself: this reduces friction and allows a correct sliding. This makes it possible to move the teeth keeping torque and tip unchanged. The mechanical retention of the composite on the segment of the wire to be bonded on the canines was increased making incisions with a small round diamond bur. The activation to close the diastema between the incisors was accomplished binding an elastic chain between the 21 and the 22, activating it in the opening and blocking it with a metallic binding between the 11 and the 12. 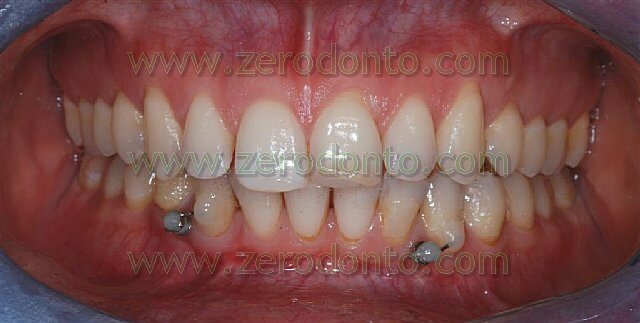 After 3 weeks that chain was renewed and after about 40 days the diastema was finally closed. At this stage some grooves from the composite to the wire were made with a small round diamond bur (the wire itself had superficial incisions). Afterwards adhesive and fluid composite were put in place to fill the grooves. These procedure makes it possible for the composite to bind to the wire and blocks the sliding mechanics. After blocking the centrals, the laterals are moved mesially following the same procedure. When the mesial drift of the 22 is achieved, this is blocked using a figure-of-eight metallic binding between the 21 and the 22. 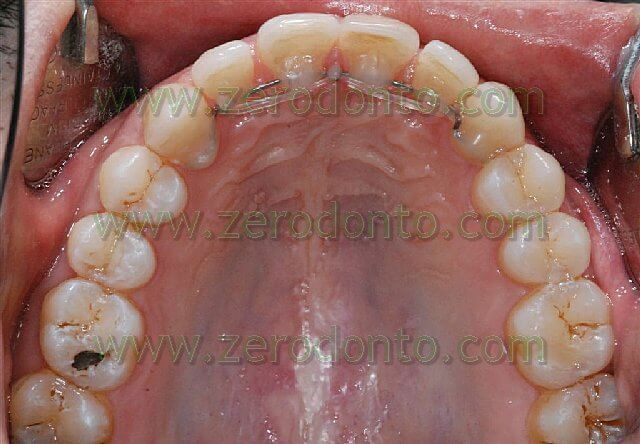 In the meanwhile the mesial drift of the 12 is still active. When the space between the 11 and the 12 is closed, the wire will be blocked by both laterals creating the grooves between the composite and the wire as previously explained. 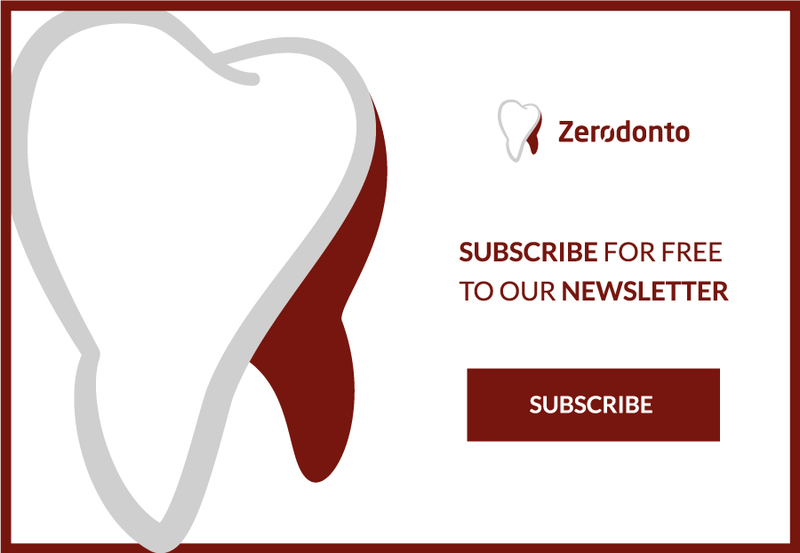 Stabilizing steel sectionals will be shaped: they will be perfectly passive and clinging to the lingual surface of the lateral maxillary sectors from the canine to the 2nd molar. 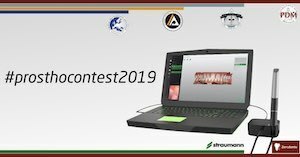 Using a vertical U loop the spaces between the canine and the lateral incisor of both sides will be closed drawing the incisors back and normalizing the OVJ. On the mandibular arch a micro-screw will be positioned between the 1st and the 2nd right premolar: it will be used as anchorage to move the right canine distally, obtaining a class I relation. That micro-screw will also be used to move the other dental elements (bound together using a steel sectional) to the right, centring the midline.